Multidrug-resistant strains of E. Coli (meaning they are resistant to most antibiotic drugs) can be found on retail chicken meat . Beef and pork on the other hand are much less likely to harbour these strains of E. coli . The exact same strains have been isolated from urine samples of people suffering from UTIs . Why are these pathogens on the meat? The pathogens come from contamination of the meat with chicken faeces, often occurring in the abattoir. Contamination seems to be common in conventional retail meat. Routinely feeding chicken antibiotics has also been implicated in selecting and amplifying drug resistant strains of pathogenic bacteria such as E. Coli (4). In the UK, only caged animals like chicken and pork are routinely fed antibiotics – Lamb and cattle are mostly reared outside. In the US, routine feeding of antibiotics is much more common for all animals. Crowded spaces are often breeding grounds for infection and this is most likely also true for the crowded conditions experienced in factory farming. Thanks to contamination and drug-resistance coupled with often inefficient and untargeted treatments for UTIs, we could be facing ‘superbugs’ that may be very hard to get rid of indeed. Does cooking not get rid of Pathogens? Although thorough cooking should normally destroy pathogens, it’s not always the meat that causes infection but often the cross contamination that happens when raw chicken is handled in the kitchen. In one study, volunteers cooked and prepared frozen chicken in their own kitchen. Afterwards, their stool was sampled for the bacteria and different strains of antibiotic-resistant E. Coli had managed to migrate to one (but not all) of the volunteer’s guts, from where they would then be able to migrate to the bladder . This happened after the chicken had been prepared but before it was eaten. Therefore, it doesn’t seem to matter if the chicken is fully cooked – it’s the handling of contaminated meat that is the main issue. In the gut, pathogens can multiply and migrate to other areas. Although they may not take up residence, regular consumption of chicken could introduce these pathogens into the body again and again. Even thorough cleaning of the kitchen area after handling chicken does not get rid of all the pathogens . So what does this mean for us? Avoid chicken all together? That would obviously be difficult for a lot of people. Luckily, the studies have shown that not all humans contract pathogenic bacteria from chicken meat. Most likely it would be those with a weak immune system. A healthy diet and stress-free lifestyle can support good immune function. Additionally, we can source meat that is less likely to harbour drug-resistant pathogens. As I mentioned above, contamination with drug-resistant pathogens often affects conventional raised chicken meat. These chicken are routinely fed antibiotics and are raised in extremely crowded conditions. Not a healthy life for a chicken. Many supermarkets are now also selling organic chicken. But is this any better? Research suggests that organic meat is almost as contaminated with E. Coli as conventional meat . However, not all supermarket organic meat is ‘proper’ organic, meaning sometimes it may just mean the hens are fed an organic diet. Additionally, organic hens may even be slaughtered in the same abattoirs as conventional meat and may get contaminated there. On the other hand, free range chicken has been shown to not only harbour less pathogens but the pathogens that were found were also more resistant to antibiotics . I occasionally eat chicken (always free range and/or organic) and have never contracted an UTI since I started eating meat again 3 years ago (I had previously been a long-term vegetarian). 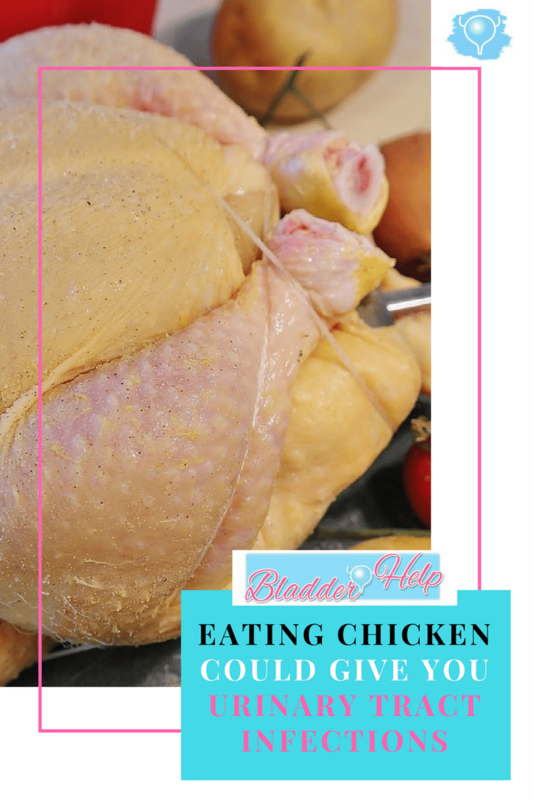 I don’t believe that eating chicken will automatically give us a bladder infection. However, I do believe we can minimize the chance of infection as much as possible by only buying small-scale and local free-range chicken from non-crowded conditions, organic is probably preferable. It is not only healthier for the animals but also healthier for us. Now I’d like to hear from you: Do you suspect that chicken has given you UTIs? Let m know in the comments!